Once upon a time in 2000, Susan Riecken and Allen Andersson began thinking about retirement but decided to first try and solve some of the most immediate needs of remote Central American villages: food, medicine, schools, agriculture support, jobs. They soon realized that the easiest to transport and highest value solution they could offer was information – and access to it. 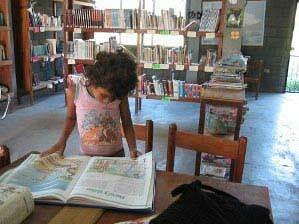 They created the Riecken Foundation, which over the years and with the hard work of many, has created a network of 65 libraries in poor, rural communities in Honduras and Guatemala. Learning through experience that the key to a successful library is strong community governance, the Riecken Community Library Model was developed and to this day is critical to the sustainable management, funding and staffing of each Riecken Library. The partnership between community, municipality and the Riecken Foundation keeps our libraries strong. 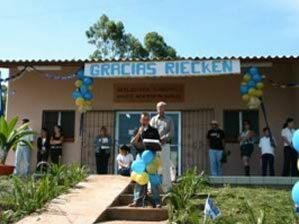 And leveraging the local resources greatly increases the impact that Riecken Foundation donor funding provides. Today Riecken Community Libraries are far more than places where books and information are available. They are lively community centers where access to information and dynamic programming relevant to the community in which the library exists, do change lives. What Makes a Library a Riecken Library? Central Americans have always loved to read. 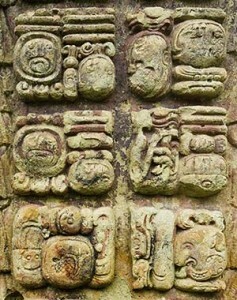 As far back as the year 426, when most of Europe was still illiterate, Mayans in the Copán region of Honduras were carving the deeds of their kings and warriors into stone, where generations can still read the thrilling history of their ancestors on the temple walls. By the 20th century, libraries in Copán had lost that ancient spirit of adventure. With signs warning Do Not Touch the Books and Absolute Silence in the Children’s Section it was little wonder that readers stopped visiting, and librarians stopped showing up, too. We knew we could do better. After the first few Riecken libraries went up with open stacks, a noisy children’s section, and free lending circulation, the news spread like wildfire. The village of Dulce Nombre, not far from the ancient stone city of Copán, waited two years after applying for a Riecken library. Finally Dulce Nombre had risen to the top of our list for new construction. Village elders were showing us around town, telling of the preparations they had made while they waited – trustees from all sectors of the community, a piece of public land reserved for the new library, a contract with the mayor to pay for utilities and a librarian’s salary, volunteer work crews ready to lay the foundation with locally donated materials. They took us to a pulpería, a tiny general store selling sodas and shoelaces, lard and kerosene where around to the back a sign declared Biblioteca Riecken. Inside an extra room were shelves and tables and a few dozen books and magazines, gifts from engagedcitizens. The owners of the pulpería ran the library on the side, welcoming all visitors. Riecken libraries were never just about books and Internet. They’re all about adventure, freedom, democracy, opportunity, initiative, and good citizenship. In Dulce Nombre, the Riecken spirit arrived years before the first brick was laid. I hope you’ll want to be part of that excitement too. Be sure to visit if you’re ever in our neighborhood – borrow a book, join a chess match, or read a story to the kids. And if you can support our program, I promise that our citizen leadership will multiply the value of every donation, opening a world of adventure to thousands of visitors young and old.